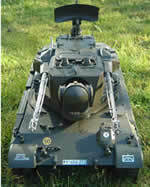 TankZone is provided for tank enthusiasts by tank enthusiasts. We only supply tanks that we run ourselves. Here's some photos of the Tamiya 1/16 Gepard anti-aircraft tank we have in our collection. It is a running model but we are in the process of upgrading some of its components and add more functionality. The various moving features are synchronised. For example the twin cannons elevates as the turret rotates. The radar dish at the rear of the turret is also motorised. We are modifying it for independent movement using a six channel controller. We may even try to get the tracking radar at the front of the turret to rotate. This 1/16 scale Gepard is pre-DMD and came originally with a mechanical speed controller. This has a tendency to overheat and it has been replace with a more up-to-date electronic speed controller. As it moves, the turret rotates, the twin guns moves up and down and the radar dish at the rear of the turret rotates as well. The gearbox is an ingenius piece of engineering. We will do a more detailed report on this shortly. We will be keeping you up to date with progress on a regular basis. Bookmark us now! The Gepard entered West German service in 1976 as a anti-aircraft tank to protect armoured formations. It is based on the hull from the excellent Leopard 1 battle tank with reduced armour. The powered turret contains the main twin cannon armament, ammunition and fire control system and can traverse 360 degrees. The two cannons are located outside of the turret to avoid the problem of gun gas in the crew compartment. The acquisition radar at the rear of the turret can traverse 360 degrees and has a range of 19 km. The tracking radar located at the front of the turret has a limit traverse of 200 degrees with a range of 15 km. This controls the firing of the twin 35mm guns. each gun fires burst of 20 to 40 rounds at a rate of 550 rounds per minute with an effective of 3000 m. The Gepard is primarily a self propelled anti-aircraft gun but has a secondary ground combat capability. A total of 680 rounds of high explosive incendiary and armour-piercing ammunition are stowed onboard. Powerplant: Diesel engine generating 830 hp at 2,200rpm.